Welcome to the Vickers Machine Gun website. The Vickers Machine Gun was used extensively throughout the 20th Century. It was used by many different nations and organisations. The study of the gun provides a snapshot of the whole of 20th Century warfare, including not only the technical aspects of the weapon but also the social and political nature of warfare and military mechanisation. It cannot be disputed that the machine gun, of whatever type, played a key role in the changing picture of warfare. What is interested about the Vickers is that the mainstay of the type - the Mk. I - remained in British Army service from 1912 through to 1968. It was used by the majority of fighting units, both Regimental and Corps based. Units were specially established to use it at particular times, such as the Machine Gun Corps, and the majority of other fighting units have some link to one of its variations. 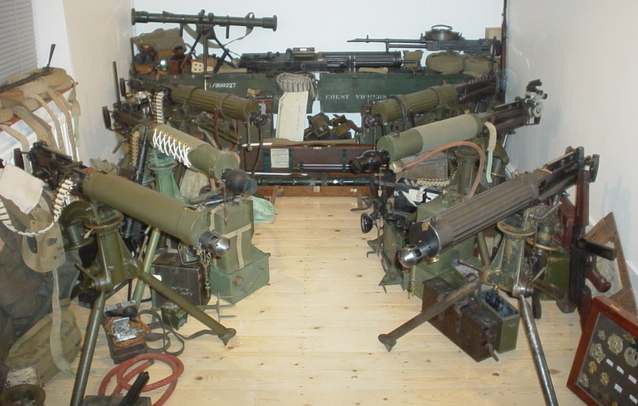 The main aim of this site is to inform people about the Vickers Machine Gun and the people who used it around the World. This is not about the glorification of weapons or warfare but about historical research and remembrance. It's an extension of that ethos that has driven me to collect many of the items shown on this site and will hopefully extend further into a formalised Association to ensure that the collection and research is embodied for future generations. I appreciate all comments about my website and its content whether good or bad (but hopefully constructive!). If you would like to make a comment about my site then please visit the forum or contact me using the links at the left hand side of the screen. I hope that you enjoy this site as I have enjoyed writing it and I have enjoyed communicating with the many people that this site has brought together. To receive updates and participate in discussion about this website please join the page on Facebook and participate in the Forum.